But only in lateral view. Other plates show photos in lateral, anterior and posterior views, and these are useful even though they’re much less clear than the drawings. 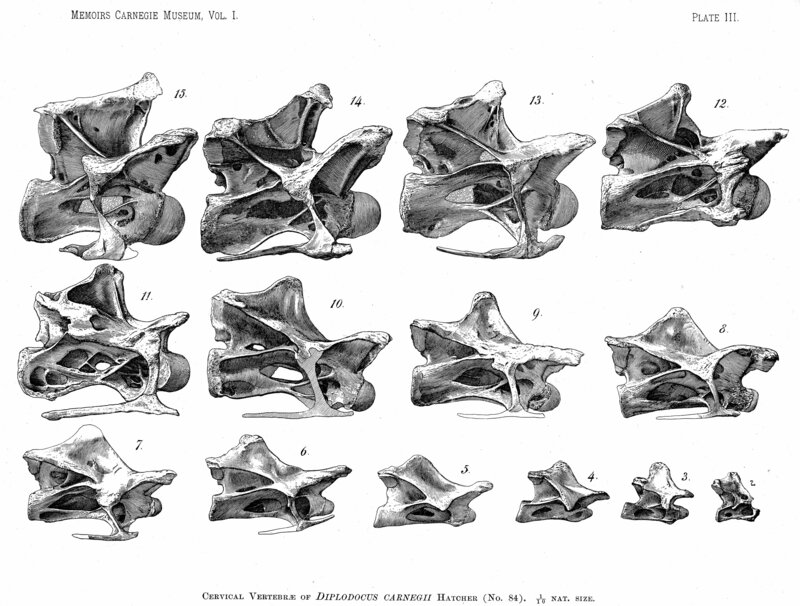 But he didn’t illustrate the vertebrae at all in dorsal or ventral view — and as far as I know, no-one else has done so either. I would find these views really useful for something I’m working on. Does anyone have photos? 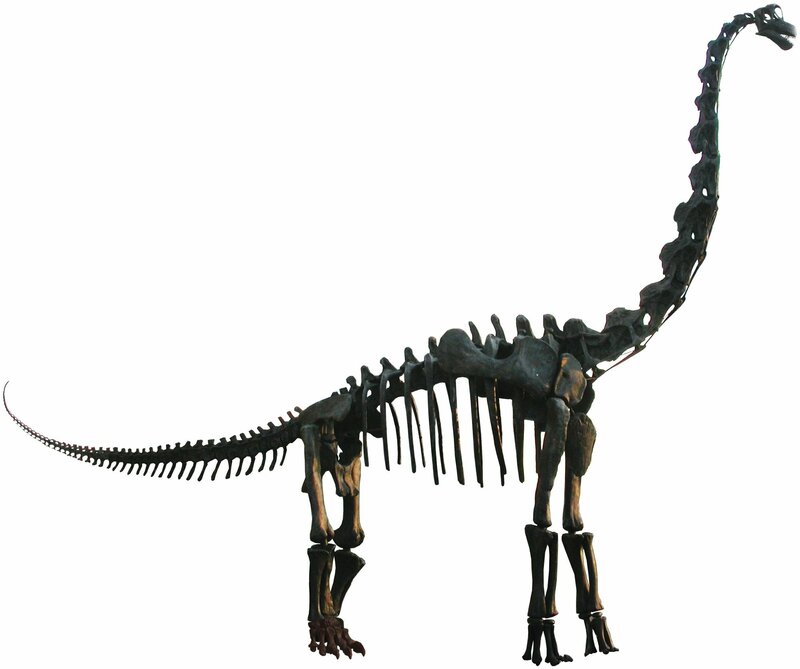 Filed in cervical, diplodocids, Diplodocus, help SV-POW! Here’s the mounted skeleton of Brachiosaurus altithorax outside the Field Museum in Chicago, based on the holotype FMNH P25107, with missing parts filled in from the mounted Giraffatitan brancai MB.R.2181 at the Museum für Naturkunde Berlin. To see it with humans and other animals for scale, go here. And here’s the same thing in silhouette. It may be informative to compare this to the very different silhouette of the mounted Rapetosaurus krausei, also at the Field Museum. I’m putting these up so they can be used. Like everything on this blog, these images are released under the CC BY license, so you can do with them what you like as long as you credit us. Go nuts! A while back, Elsevier launched its journal finder, tagged “Find the perfect journal for your article”. Since our priorities in choosing a journal are a bit different from Elsevier, here is the SV-POW! journal finder. In a paper for which we’re currently handling the revisions, I and Matt cite several pieces of artwork, including Knight’s classic Brontosaurus and Burian’s snorkelling Brachiosaurus. Knight CR (1897) Restoration of Brontosaurus. Burian Z (1941) Snorkelling Brachiosaurus. Please edit the reference list with additional information, e.g. : “on the NE wall of the AMNH Hall of Saurischian Dinosaurs” or whatever is appropriate for [these references]. I don’t really have any idea what the right way is to cite artwork — does anyone? And does anyone have the necessary information? We all know that Zallinger’s “Age of Reptiles” mural is on the wall of the YPM dinosaur hall, but where are the originals of the Knight Brontosaurus and the Burian Brachiosaurus? Filed in Art, Brachiosaurus, Brontosaurus, help SV-POW! Figure 1: Differences in reference systems in skulls. (A) In the human skull there is a 30° difference between the Frankfurt plane and that of the LSC, thus yielding substantially different head orientations (from de Beer, 1947). (B) When a stork is in alert its LSC is oriented 19° above the horizon, thus when putting the LSC at 0° (horizontal) head posture differs from its alert posture (from Duijm, 1951). I know it’s been quiet around here for a while. Mike and I have both been on vacation, and before that, we were both up to our necks in day-job work, and after we get back, we’ll be up to our necks in revising accepted manuscripts. So no time for a long post right now, but I couldn’t let this pass without notice: Jesús Marugán-Lobón, Luis Chiappe, and Andy Farke just published a cool paper on semicircular canal orientation in saurischians and its value–or lack thereof–as a reference system. This is something Mike and Darren and I have addressed before (here and here), but Marugán-Lobón et al. have gone waaaaay further than anyone else I know if in addressing the inherent variability in lateral semicircular canal orientation. 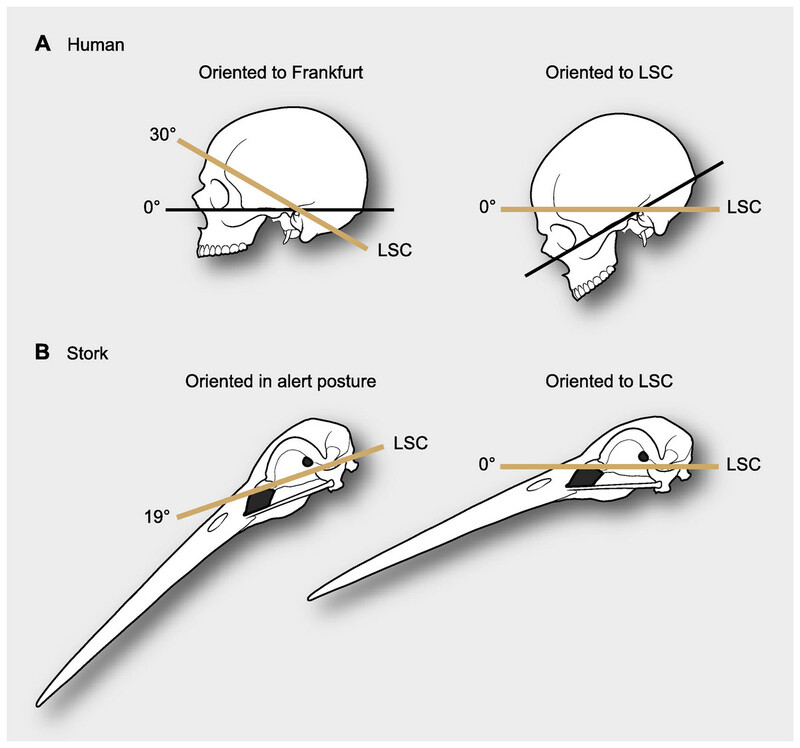 The variability of LSC relative to skull landmarks is large (ca. 50°) and likely unpredictable, thus making it an inconsistent reference system for comparing and describing the skulls of saurischian (sauropodomorph and theropod) dinosaurs. But you shouldn’t stop there! The paper is short, straightforward, and freely available on PeerJ, so go read it. Read the review comments, too–like an increasing number of authors, Marugán-Lobón et al. put the whole paper trail up along with the finished paper. Nice work!